The Trusted Zone is a list of exclusions from the protection or scan scope. 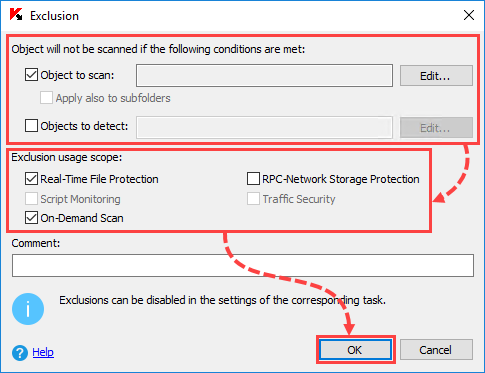 You can create this list manually and apply it to On-Demand Scan, Real-Time File Protection, Script Monitoring and RPC Network Storage Protection tasks. By default, the Trusted Zone is applied to Real-Time File Protection and newly-created custom On-Demand Scan tasks, as well as to all system On-Demand scan tasks except Quarantine Scan tasks. After you have enabled or disabled the Trusted Zone, the exclusions will immediately either stop or start working in running tasks. In the Application Console tree, open the shortcut menu of the task you want to configure the Trusted Zone for. In the General tab, select or clear the Apply Trusted Zone checkbox. 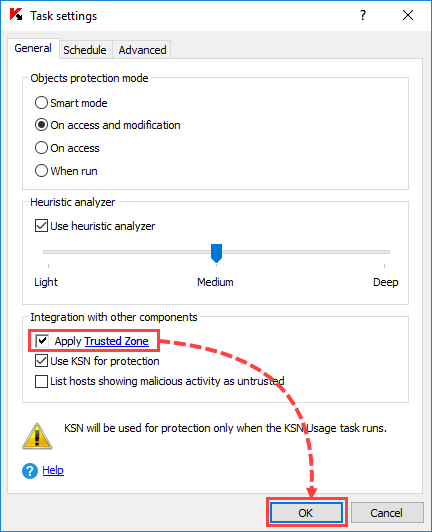 If you want to configure Trusted Zone settings, click the Trusted Zone link. Use of the Trusted Zone will be enabled or disabled. In the Application Console tree, open the shortcut menu of the Kaspersky Security node. Select Configure Trusted Zone settings. In the Exclusions tab, click Add. Select the Object to scan checkbox. 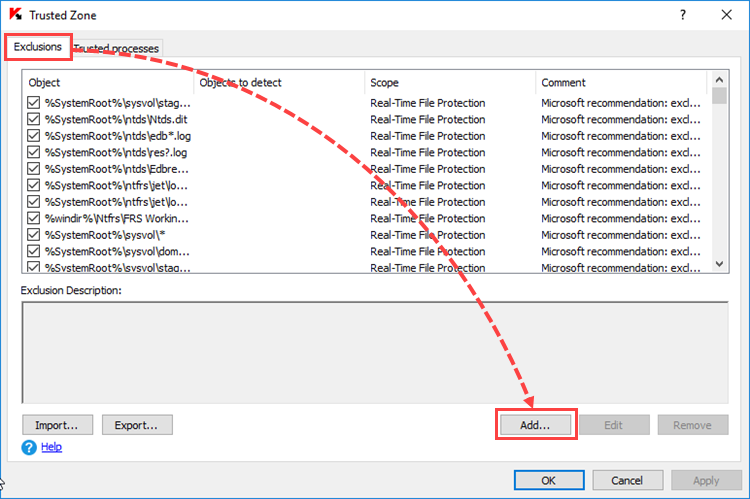 If this checkbox is selected, Kaspersky Security 10.x for Windows Server skips the IP range, file, folder, disk or script file when starting a scan using the Kaspersky Security 10.x for Windows Server components selected in the Exclusion usage scope section. This checkbox is selected by default. Select the object that you want to exclude from the scan scope. When specifying objects, you can use the special characters ? and *. Select the Objects to detect checkbox. If this checkbox is selected, Kaspersky Security 10.x for Windows Server skips the specified objects during scan tasks. If the checkbox is clear, Kaspersky Security 10.x for Windows Server detects all the objects specified in the application by default. This checkbox is cleared by default. Specify the name or a name mask of the detected objected according to the Kaspersky Lab Virus Encyclopedia classification. In the Exclusion usage scope section, select the checkboxes beside the names of the tasks to which to apply the exclusion. The exclusion will be added to the Trusted Zone. C:\dir\*. * or C:\dir\ — all files in the C:\dir\ folder. C:\dir\*.EXE — all files with the EXE extension in the C:\dir\ folder. C:\dir\test — all files named test in the C:\dir\test folder. dir\*. * or dir\ — all files in all dir\ folders. dir\*.exe — all files with the EXE extension in all dir\ folders. dir\*.exe — all files with the EXE extension in all folders. dir\test*. * — all files with names starting with “test” in all dir\ folders are excluded. For example, C:\temp\dir\sub\test2.exe.